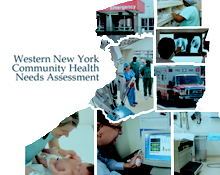 To inform a project plan grant application being prepared by emerging Performing Provider Systems (PPS) for the NYS Department of Health, the UB Regional Institute, in collaboration with HMS Associates, conducted a comprehensive regional community health needs assessment covering the eight counties of Western New York. The overarching goal of the initiative was to identify opportunities to improve the quality of care provided to Medicaid recipients while reducing unnecessary costs. Our team designed, deployed, compiled and analyzed findings from a broad-based consumer survey organized around indicators tracked at the national and state levels through the Behavioral Risk Factor Surveillance System. The survey (available on-line and in hard copy) offered participants an opportunity to respond to open-ended questions about most pressing issues in health and in the health care delivery system. Health care organizations, insurers, community groups and others helped to promote the survey through email and social media.To engage non-English speaking consumers the survey was offered in Burmese, Karen, Arabic, Somali and Nepali, as well as English and Spanish. The survey generated more than 7,000 responses. Respondents were representative of the region’s age demographics, population of constituent counties, and the ratio of Medicaid to non-Medicaid insured individuals. Findings shed light on important differences between Medicaid and non-Medicaid consumers in terms of health care access, utilization, outcomes and risk factors. The survey offered valuable consumer perspectives on the state of health care and opportunities for improvement. This entry was posted on April 8, 2016 .